For the adventurous home brewer who wants to take all grain beer brewing to yet another level, you can malt your own grains at home. While most micro and home brewers start with malted grain, it is possible to purchase unmalted grains and go through the malting process at home. The equipment required is modest, and bulk unmalted grains can be purchased at a fraction of the cost of malted ones. Unmalted barley is widely used for animal feed, so a good place to purchase unmalted grains in bulk is likely a local feed store. Usually it is sold in large quantities – typically 50lb to 100lb bags. Smaller quantities can be purchased from some brew stores, pet stores or equestrian specialty shops. There is a lot of variation in unmalted barley quality. 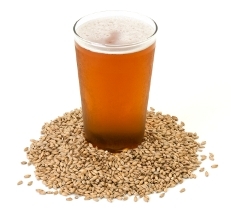 If possible, you want to choose a barley that is low in protein as high protein will result in cloudy beer. Inspect the grains if possible before buying to look for minimum broken grains, absence of mold or bugs, consistent color and general overall quality. The first step in home malting is to steep the barley in water to begin the germination process. Start with a large bucket that can handle the grains plus enough water to float all of the grains. Add water until all of the grains are floating, and let the grains sit in the water for 2 hours. Remove the grains from the water (a strainer is good for this) and let the grains air out and dry for about 8 hours. This step is important as if you leave the grains in the water they will drown and eventually die. After the grains have dried for about 8 hours, steep them again in a clean batch of water for another two hours, and dry them again for 8 hours. You will likely have to continue this for a third cycle. Within 24 hours of starting, you should see small roots start to grow from the base of the kernel (called chits). Stop your cycles of steeping and drying once you have 95% of the grains germinated. You should have added approximately 40-45% moisture (water) at this point. Assuming you started the dry grains with ~9-10% moisture content, adding 35% moisture will result in a weight gain as follows: 1 kg of grain has ~100 g of water before steeping. Adding 350g of water (45% water content) results in a total of 1.35kg. So if you started with a given weight of grains, you can stop steeping when the grains weigh 30-35% more than when you started. The grains must now be germinated in a cool, slightly moist, but well ventilated area to grow the small leaflet inside the grain called an acrospire. This generally takes 2-5 days. The ideal temperature for germination is 64F, or about 18C. You want to keep the seeds cool, spread them out well and moisten them periodically with a little spray mist. The germination process generates heat, which can lead to bacteria or mold growth so its important to aerate the grains and turn them every few hours in a cool location to avoid infction. Many early malters actually spread the grains on a concrete “malting floor” to keep them cool and make it easy to turn them periodically. You continue malting until the small leaf (acrospires) within the grain is approximately 80-100% of the length of the grain. Note that the acrospires is inside the grain, so you need to actually split the grain open with a knife or razor blade and look for the white leaf that is part of the endosperm and attached to the rootlets. Typically the external portion of the rootlet will be about 2x the length of the grain when it is finished, but checking the actual acrospire length is the best method to determine when to stop. Drying the malt can be difficult as it requires a steady temperature of between 90-125F (31-50C). Drying at a higher temperature will destroy the enzymes needed for mashing. If you are fortunate enough to have an oven with temperature control that can go this low, then leaving it in the oven for ~24 hours is an excellent way to go. In some cases, even the oven light is sufficient to reach the 90F temperature needed, though it may take some time to finish. If you live in a sunny dry climate, sun drying is also an option. Some care is needed to keep birds and other small scavengers away, but you can leave it out in the sun for 2 days which should be sufficient to dry the malt. A third option is to use an actual food dehydrator. Inexpensive home food dehydrators are available for as little as $30-40 and work quite well. You are targeting a finished moisture content of approximately 10%. Assuming you have not lost much material in the first two steps, this would mean the finished weight of the grains with their rootlets attached should be close to the total weight of the unmalted grains before you started the steeping process. Recall that we started with about 10% moisture content in the original unmalted grains. Therefore you can stop drying when the grains plus rootlets weight are back to approximately their original unmalted weight. The last step is to separate the dried, malted grains from the rootlets growing out of them. After the grains are sufficiently dry, the rootlets will simply fall off them with a little agitation. You can use a colander or some screen to shake the grains around and separate the dried rootlets. Note this is a bit of a messy process, as the rootlets tend to get on everything, so you might want to do this outside. At this point you have pale, malted barley equivalent to that which you would normally purchase from your brew supply store. You can crush it and use it just as you would any pale barley base malt. If you wish to make specialty malts from your pale barley, you can toast the malts in the oven to make varying shades of crystal, toasted, brown malts. For the lightest of crystal type malts, try toasting at 275F for one hour. For a medium crystal, try toasting at 350F for 15-30 minutes. If you toast at 350F for an hour you will come close to a commercial brown malt. You can also get different variants by toasting wet vs dry malts. A wet toasted malt will impart a slightly sweeter toasted flavor. For more on home malting, her is an article on Bodensatz by Dan Carol which I used when malting on my own for the first time. Geoff Cooper also has a short article on roasting malts. I’ve been malting feed barley and corn, along with store-bought wheat and rye for a while now. It’s 90 °F inside here in the summer, and they all sprout OK. Winter is better for barely because it’s cooler. But it’ll sprout when it’s hot too. You just have to stir and air it out more to keep it from cooking. Corn gets really hot when it sprouts. I tried sprouting some in an ice chest once and I couldn’t hardly put my hand in it. That’s why you spread out the grains when they are sprouting. Just to keep them from cooking. I’m not sure if anyone can use this info, but here’s how I do my malting. I can’t say it is the easiest way, but I just put the feed barley, or any other grain, in a big bedsheet and then soak it in the kitchen sink for a few hours. You can usually do 20 lbs of grain in a regular sink. I suppose you could do it in the bathtub too. After a couple of hours, it will soak up the water. Then, if you have a double sink, just move it over to the empty sink and drain it for a while. Soak and drain two or three times until it feels about one and a half times as heavy as it did when it was dry, then put the sheet on the kitchen floor (or in the garage, back patio, roof, wherever there is room) and spread the grain out on the sheet. Spread it in a layer about 1 to 3 inches thick if you can. But it’s OK if it’s a little thicker or thinner. Fold the ends of the sheet over to cover the grain and wait. After a day or so, there should be tiny white roots sprouting. Stir the grain when you can. It’s easy to stir the grains by just lifting the corners of the sheet to make a big hobo pouch of the grains and roll it around. Then spread it back somewhat thin before folding the ends over. Do that whenever you get a chance, especially if the grain starts to get hot. I do it every 2-8 hours or so. If the grains are too dry, pour some water over them and stir with your hands. It’s really dry and hot here, so I add about a quart of water over them every day when it’s summertime. After 3-5 days, there should be lots of roots and the white stalk, under the husk, will have grown to about half the length of the kernel. If it is growing fast, it will have grown the total length of the kernel. You can see the stalk if you split the kernel open. I check a few and if they are between half and the full length of the kernel, I figure it is time to dry it out. If you forget to check for a day and then you see the stalk coming out of a lot of the grains, you can still use it. By then, there isn’t much starch left to be made into sugar, but there are a lot of enzymes to change other starches to sugar. So, if it went too far, just add some boiled potatoes or rice or some cooked starchy thing when you do your mash. You can get sugar from that instead, and it will make OK beer. Some of the green malt can be put in the oven at 150 °F, or so, for about an hour to dry it some, then baked at about 300 °F for another hour and a half or until it is golden brown (stirring every once in a while). This will turn the starches to sugar and make it a sweeter malt. But it won’t help convert other malt into sugar when you mash. It’s like crystal malt. To dry the grain, I put two large plastic storage bins side by side. They are facing up, like normal. Then I put a window screen over the top of both them. Then I spread the malt on the screen and lay a box fan right on top of them facing down. I put half the fan over one bin and the other half over the other. That way, when I turn the fan on, the air blows through the malt down into the empty bins then flows back up towrd the malt again. I turn the fan on high for a couple of days to dry the grains and stir it whenever I get around to it. This seems ot be an easy way to dry the malt. And you don’t need a heater to do it, even when it is cold. I don’t do anything to get the roots off. I guess there is a good reason for doing that, but after baking the malt, there really doesn’t seem to be many roots left anyway. After drying the malt, I usually put it in the oven around 160-200 °F for a few hours to get it really dry. It can take up to 5 hours to get it really dry. It’s crunchy and tastes OK when you chew on it. After roasting, I crack it in a hand crank corn grinder. They are about $20-40 at the sporting goods store. But, instead of the crank, I put a large bolt in the shaft and use a hand drill to turn it. It takes about 10 min to grind 20 lbs of malt. After that, I put it in a bin and use it when my beer keg is getting low. A person can easily turn out about 20 lbs of malt in a week this way. With 15 lbs in a mash, I get about 1.040 OG on 5 gal from whatever feed barley is available. This may be low yield on the malting and mashing, and the beer may be a little cloudy unless it’s aged, but it gives 5-6 %ABV. At $10/50 lb bag. it comes to about 8 cents per 12 oz beer. Not too bad from feed grain. When you say “steep” are you taking about HOT water or cold, cool, warm, or what? The article doesn’t really say. Also, what should I ask for, at the seed plant, when I want Barley seed to boil, swell, and EAT, or… if I want to SPROUT it to eat? Large quantity….50# to 100#….lol…… I commonly buy in 3 to 5 ton quantities for my winter grain for livestock. I bought 8 tons last year for feeding 15 hogs from 50# weeners to 325# pound slaughter hogs. Buying in bulk….. what I consider to be in the measure of tons, is much cheaper, I can get wheat and barley for around $200 to $250 a ton, oats at around $175 a ton. Usually I get it for ani9mal feed and to make our own stone ground flour, but now am getting into malting for beer making as well. I guess for someone who owns a farm “bulk” has a bit of a different definition…. I’ve read that in order to make crystal/caramel malts you need to ‘mash in the husk’ so that your first stage of drying the green malt is to put it in the oven at 150F (mashing temp) prior to ramping up to higher temp 300F for drying. Then how long you dry for gives you the various types of crystal with longer times yielding darker malt. This malt has zero diastatic power and produces unfermentable sugars to add sweetness to the finished beer. I have an excellent source for two row barley since I live in a very rural community. We have our process down from the germination to the drying. The difficult part we are having now is with the specialty grains. The crystal is not too difficult with our stove set up. The issue I am having is with the darker malts. I have seen online where people are using old rotisseries and a coffee can inside. I am curious if anyone has had any experience with a coffee roaster? Or even just a whirly pop? I have seen where they are using this to roast coffee. Any comments or input? During the soaking process, after you strain the water out, do you need to spread the grain to allow to dry before re-soaking? Or, say if I am using a 5 gallon bucket, would I just drain the water out and leave the grain in the bucket? If I cannot exceed the temperature of 120 during the drying process,,,,,, less it destroy the enzymes, why can I heat the malted grain to 350 and to get dark malt, and not destroy the enzymes ? I am very very curious about this. Robert, as I understand it you do destroy the enzymes but as you only use the specialist malts as a small fraction of the malt bill in the mash the other pale malts that do have the enzymes will do the work needed to convert the starch. Great article! This gives a profound understanding. Seems to be promising method. Any opinions?!? The reason you are reading two different techniques for curing the barely is because some of the barley is used with enzymes to convert starch into sugar, roughly 90 percent depending on the recipe. the other barley is used for color and flavor of the beer. the barely that has been “cooked at 350 for an hour will have no enzymes but lots of flavor and sugar. the barley cooked for two hours will all flavor and no sugar or enzymes. I have read your fantastic tutorial. Please, how can one get the malt or barley to practice this. Thank you. You can purchase unmalted barley from any feed or grain store – usually it is sold as animal feed. First question: what is the differens for me as a home brewer making my malt from feed barley compared to barley grown especially for brewing. And how can I compensate for whatever the differens in performance is between the two? Second question: how can your software BeerSmith help me develop as a brewer and will it work on Mac?